Mi sembrano dei capi assolutamente indicati per la primavera!!! I've been seeing a lot of off the shoulder tops. They're so romantic. Love the flowy ones. Great Tips and Ideas Lilli! Sono alla ricerca di un top off the shoulder che sia estremamente chic... devo trovarlo!!!! Una bella selezione, l' embroidered è veramente bella! I love them all, honestly :) I have each type of the styles you mentioned in my closet, therefore, I was so happy to read that our styles matched up! For some reason lately I've been really loving the off shoulder type of tops and dresses - they just look so sincere and romantic! I'd love to add an embroidered top to my closet. It's such a sweet and feminine detail. I also really like the soft romantic look of off the shoulder tops but I'm not sure if I could pull one off since I have such bony shoulders LOL. Have a great week Lilli! E' tutto molto hippie, sai che mi piace tanto la camicia con le balze? Decisamente un must have per chi ama questo stile! Ios elgo il modello off the shoulder Lilly perche quest anno è troppo di moda! The off the shoulder style will look great on you Lilli. Go for it. It's such a feminine style. I wouldn't mind that embroidered top too Lilli. Especially in that colour. I've seen a few around in that colour and I've been slowly falling in love! 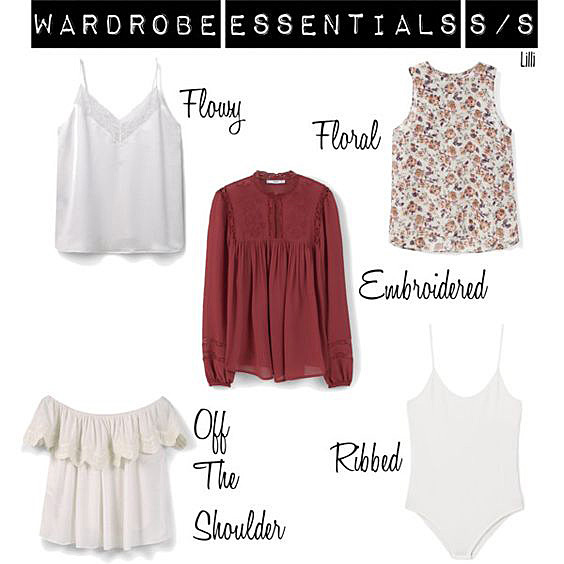 your chosen key pieces that are going to shift to spring wardrobe, the off shoulder is hot trend, nice selection Lilli! Kisses. I am so in love with the off shoulder style! The weather is so unstable that I don't know what to wear.